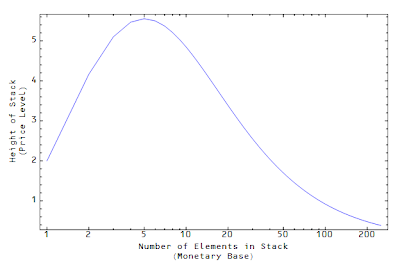 Building off of this post, I'd like to show how you might visualize how adding to the monetary base can cause your economy to expand ... up to a point. Base money is behaving both as the number of "bits" used to describe the economy (i.e. receive the information transferred from the aggregate demand) as well as a determination of the meaning of the unit "bit" (i.e. how many bits the aggregate demand consists of). In analogous economic terminology, money is the medium of exchange (the monetary base determines how many dollars are available) and the unit of account (the definition of a dollar unit). This is the mental picture I have in my mind when thinking about an information trap in the information transfer model. Yes, it seems obvious that the value of each added unit of money approaches zero. But if the value of money is decreasing, doesn't that mean that prices are rising? Since each dollar will buy less? I should probably be more careful with my language -- the information carrying value of each dollar decreases (dollars carry fewer "bits"); the value of a dollar itself is usually just measured by ~ 1/P where P is the price level. P is proportional to the total number of bits. If each dollar carries 1 bit and there are 10 of them, the price level is 10 bits. If you add 10 more dollars, but that causes the dollars to carry only 0.9 bit, you have 0.9*(10 + 10) or 18 bits. The economic value of a dollar went down by a factor of 18/10 = 1.8; the information value of a dollar went down by 10% from 1 to 0.9. The way that I have thought about QE, which I guess is an example of what you are talking about, has to do with money in or out of circulation, or, more generally, of the velocity of money. In general terms, increasing the amount of money can reduce the velocity of money. Con permiso, here is a non-economic example of information transfer that I have been thinking about. Years ago I modified a guessing game for my students in a problem solving class at an alternative high school. The object of the game is to find and defuse a bomb in a building with a million rooms (100 rooms x 100 rooms x 100 rooms). At each turn you enter one room and get information about the location of the bomb, relative to that room. You win if you find the bomb in 20 moves, otherwise it blows up. Playing 20 questions you have better than a 50% chance of winning. You can find out where the bomb is at move 20, but you may not be in the right room. (They had learned about binary search.) But the information that you get is not worth 1 bit. The bomb is radioactive and you take a Geiger counter reading in each room. The kids did not know enough physics to triangulate the location of the bomb, but I planned to have the physics teacher come in and explain that to them. Am I right that taking the Geiger counter readings are like currency? If you know how to triangulate, then most of the 20 readings that you have are superfluous. You don't need them. Their value is nil, and they don't get "spent". Their "velocity" is nil, as well. In this case there is no "deflation". It still takes 20 bits to locate the bomb, whether some readings are superfluous or not. I don't know whether this is a helpful analogy or not. You can see a similar way I've tried to look at the problem. Let's change your analogy a bit. Say there are several bombs in the building and what you want to do is reinforce the doors of those rooms. The bombs are supply and the reinforcement is demand. When you reinforce all the rooms with bombs in them, you win -- supply meets demand. Money is then a bit like Geiger counter measurements. If you have only one bomb, you don't need as many measurements. But if you have a lot of bombs, you'll need more and more measurements to get unambiguous locations. At a bare minimum you need ~ k log n/k measurements as long as your distribution of bombs is sparse (k << n). As k increases (k ~ n), you start to need to measure all of the rooms (effectively the Nyquist sampling theorem).